You can submit your Web 3D art to these galleries and get it promoted and showcased for all the world to see. Don't doubt that this is a great way of getting a good reputation as a Web 3D artist. MixED, The Collective 3D Gallery: It is conceived as a collective 3D art gallery. It's collective because its aim is to show the woks of many worldbuilders in the VRML and X3D scene. Read the post about them. Web3D Art: Web3Dart is hosted at the Web3D Conference supported by the Ministry of Art and Education, Vienna (Austria, Europe). 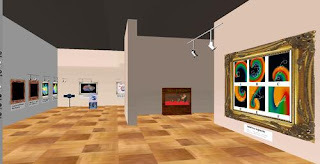 It showcases and selects the most interesting works of art in 3D in the Web. You can submit your works too. Cardiac Museum. 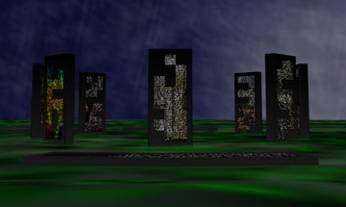 One of the selected works. There are works that go from the academic and learning to the artistic. It's a really worth seeing place to watch good works in interactive and immersive 3D. Monolith[s], another selected work in Web 3D. Cortona 3D Page Of The Week: Shows the best works done with Cortona VRML Client. If you work with this VRML client, you can send your best works and win the honor of being showcased as 3d page of the week here. web3dart seems to not be current. They stopped selecting work in 2008. Yes but the archive is worth seeing. I hope they go back to business at some point.